Twice in the fall of 2014 I pulled a Steve Gingold by going out in the dark before dawn to places where I could get in position for daybreak. Last year I showed a picture from the first of those two sessions but none from the other. 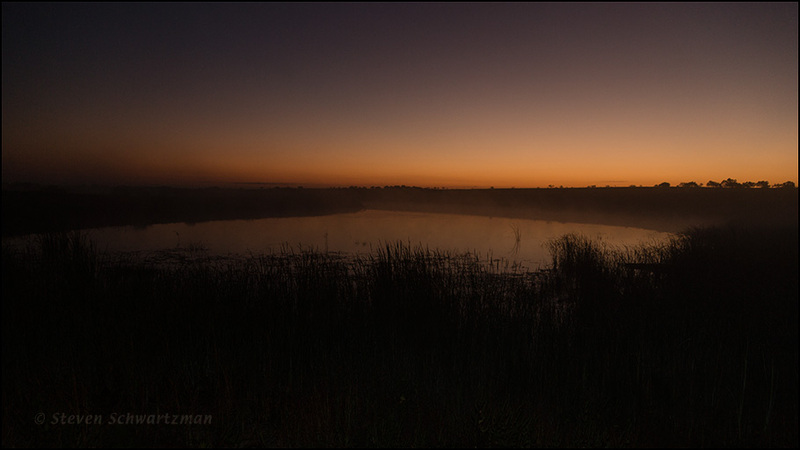 Here, then, on the one-year anniversary of that second dawn expedition, is a photograph taken at a pond on the eastern side of Buda, a rapidly growing town south-southwest of Austin. Cattails (Typha latifolia) stood between the water and me. Perfect. There’s just enough light for some detail, and just enough mist for effect. The silence seems palpable. As a photographer I normally crave light, but in this case having just enough light for a faint image carried the day (figuratively and literally). It was definitely worth it, yet I haven’t gone out that early again in the year since then. Maybe you could manage to stay awake long enough through the night (especially helped along by Nurse Caffeine), rather than going to sleep and then getting up very early for the new day. And hopefully shall be again. Exquisite! You have indeed pulled a Steve Gingold. I appreciate your confirmation. Thanks. What a wonderful shot Steve! I was pleased with it, Eva. You captured such a marvelous part of the day, one of the real treats in life is to watch the sunrise. It’s not unusual for me to see parts of the sunrise through the trees outside the window where I’m sitting at my computer now, but rarely have I gone out into nature for a sunrise. I’m glad I did so twice last fall. This is very nice, Steve. Wonderful serenity to it. I think you should change your body clock around and get out early more often. Serenity strikes me as the right word for this view. Getting up that early every once in a while is okay, but I don’t know that my body and brain could adjust to doing it regularly. It seems to work fine for you. Beautiful shot Steve! I love the atmospheric moodiness conveyed in the scene! Ah, yes, a little atmospheric moodiness is a great way to start the day. I was happy to be able to record the scene.